The Semper Sweater is based on the Omni Tempore shirt, that you all love so much. And the good part… The neckline options of the Omni can be mixed and matched with the neckline options of the Semper Sweater. Now, we all know the neckline options of the Omni but what about the Semper Sweater. You might have guessed but there is a Cowl option. Only, it is not separate like on the Hibernis Cowl shirt. This cowl is sewn in. The other option is a Hood. I will show you that option in this post. The Hood is made with a small overlap, but not in the center front. The overlap sits on the shoulder. It accents the Raglan sleeve in a beautiful way. The bodice has two options. One is the simple one. No pockets or anything, just a simple sew (and simple means quick, right?!). Option B has side panels. Here comes the Hibernis inspiration again. Only there are not two but there is one pocket. Simple and clean for boys. And a fun way to add print to use fabric scraps. Showing you this one later. I promise. The Semper sweater has short and long sleeve options. Both are finished with a cuff. The bottom is finished with a waistband. And…. We are also going to test a mini dress add-on piece that you will be able to use on both the Semper Sweater and Omni Tempore shirt. The add-on will be offered to you for $$$ FREE! $$$ Yay! 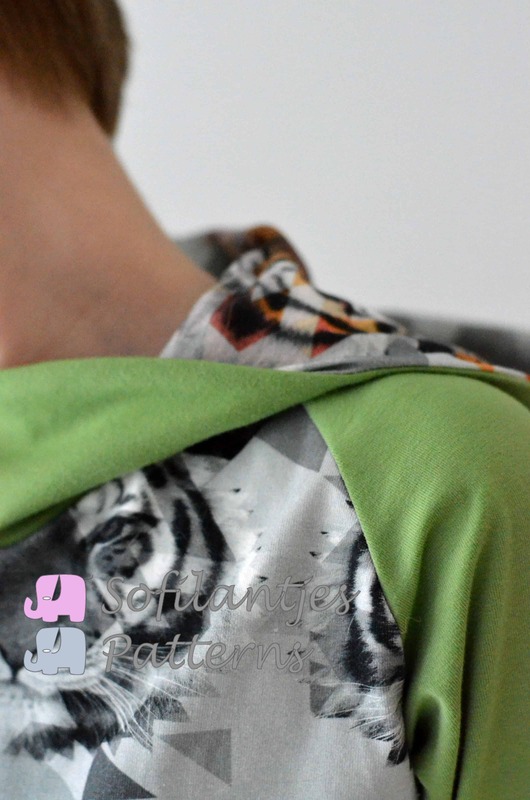 The Tiger fabric was chosen by my own hero when we visited Yvette from Droomstoffen. He wanted it for a new pyjama. The moss-green has been in my stash forever. I finally found a great match! I certainly remember that I want a boy version 😀 I’m sure it will be awesome! its perfect Anne! I already have my fabrics in mind.